anxious now to grapple with it. Writing to a colleague in the 1930s, the physicist Wolfgang Pauli confessed, “I have done a terrible thing. I’ve postulated a particle that can not be detected.” Eventually, Pauli won the Nobel Prize for his Exclusion Principle, i.e., all material particles exhibit space-occupying behaviour - and could very well fall within the province of restaurants. 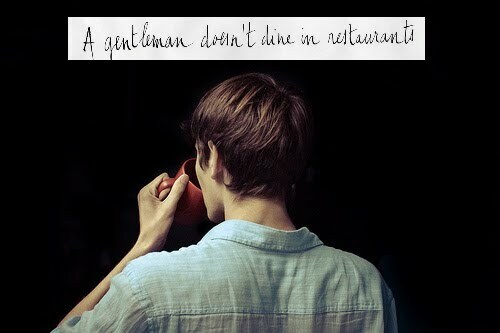 I wonder if red mug, blue linen will be that terrible thing, a postulate without a particle - that a gentleman is only that creature whose nourishment occupies no space. But whether that is true, is less urgent to know than where it comes from. Postings and other updates can be followed through a choice of forwarding sys-tems, open at the foot of the page. Comment must be attributable to a traceable source. Move your hand. Show me your wound. Please raise any question of infringement of right in the Comment section. Unless otherwise noted, all images and music are from web sources deemed to be in fair use. Attribution is requested for use of photographs by Laurent.